Facebook is constantly evolving to benefit both users and page owners. Just recently, Facebook made significant changes to the layout of businesses pages resulting in improved usability and easier access to business information. As one of the biggest Social Media networks, Facebook is great for raising awareness of your brand. The opportunities are plentiful and there has never been a better time to establish a page for your business. Firstly, a few reasons why your business should be on Facebook. Brand exposure: With over 1.59 billion users, Facebook is a great platform for increasing brand visibility. Customer expectation: According to Social Media Examiner 95% of Millennials expect brands to have a Facebook presence. Maintaining communication: With Facebook you can happily post updates to your followers four/five times a day without losing subscribers. Imagine the consequences if you were to send that many emails? Soft sell: Nothing moves people more than beautiful, compelling pictures. Gone are the days where your message was ‘Buy me now!’. A soft sell approach is the one and approved by customers too. Good customer service opportunity: Demonstrates how efficient your business is at responding to customers. It’s FREE: Need we say more? If for you Facebook is proving to be an untapped resource then check out how some of the biggest brands are utilizing Facebook with our 5 effective ways of promoting your brand. Take a look at how Domino’s Pizza use their banner space. Domino’s use a tantalizing image to entice customers. They have a Call to Action (CTA) button located just underneath the banner image which is a technique being adopted by many brands since the recent layout changes. The banner is also a great way of pushing messages that can tie into a particular campaign. Take a look at how Netflix are utilizing their banner space to promote the release of a new original series. Remember that this banner image appears above the fold so it is essential to use it wisely to convert visitors on your page. Another recent change to Facebook news feeds was the abandonment of listing posts in chronological order and the introduction of prioritized posts from favorite users, appearing at the top of news feeds. Although this greatly improved the user experience, it did however have a dramatic impact on business pages. Facebook state, 'The specific impact on your Page’s distribution and other metrics may vary depending on the composition of your audience. For example, if a lot of your referral traffic is the result of people sharing your content and their friends liking and commenting on it, there will be less of an impact than if the majority of your traffic comes directly through Page posts.' You can find out more about the changes to business pages. We recommend creating content that is appealing, likable, funny and non-pushy. One of the most shared brands on Facebook is Skittles. They are experts in creating content that is relevant, likeable, and more importantly, sharable. 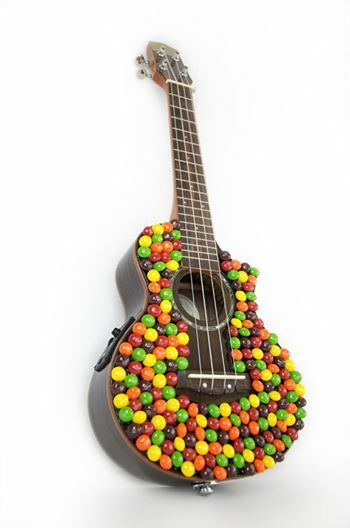 This simple image posted to Skittles' Facebook page received over 3,000 likes, 400 comments and shared over and 19,748 times. Another great way of getting content shared is to launch a competition. A lot of brands will ask their followers to share their content for a chance to win. New York Dream Holidays Competition taken from Facebook. The competition asks entrants to share the advert for a chance to win a Christmas trip to New York. The advert has achieved 1,199,209 views since being launched. Brands are becoming increasingly aware that consumers dislike being bothered with hard-selling adverts. This was actually one of the main driving forces behind Facebook’s recent changes to the way it displayed content in news feeds. After surveying hundreds of thousands of people for their views on content in news feeds, users told them that they wanted to see less promotional content. To promote their latest blog they posted it with the words ‘Think you could do it?’ Instead of saying ‘read our blog now’ they were able to engage with their followers who shared it 94 times and attracted 133 comments. Not bad for a morning’s work! Another example of this is from Amazon. 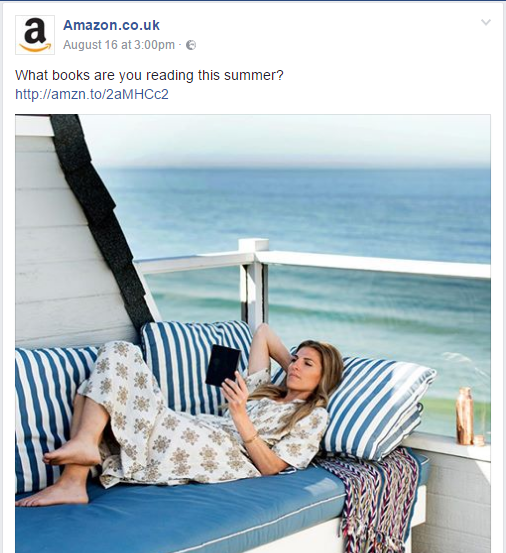 Amazon use an idealistic image to ask fans 'What are you reading this summer?' Another advantage of adopting this method is the reach potential. When fans carryout any activity on posts, whether it’s a comment or like, their activities will show up on their friends’ news feeds (providing they allow activity to be made public to friends). So in some instances getting customers to engage with your brand can be just as rewarding, especially if it’s impressions that you are after. Another way of encouraging engagement is to allow customers to provide reviews and feedback openly on your Facebook page. Don’t panic. Transparency is the key here. Consumers don’t really care about negative reviews and comments on Social Media, it’s how they are dealt with and the speed in which they are responded to. Just take a look at the snippet taken from Starbucks' Facebook page. After posting an update about Frappes they received 304 comments on that one post – some good, some bad, and some (potentially) ugly. Starbucks replied to every single comment within a matter of hours which is impressive. Yes, a large brand can afford to have a dedicated member of staff on standby to manage responses. But it is still a good marketing tactic all the same. Just to highlight the importance of this, while conducting researching for this post I came across another Facebook page. Without naming the candy brand that like to talk about tasting the rainbow, I immediately stumbled upon publicly expressed frustration shared by many, caused by the brand's inability to respond to fans. One fan even suggested that the brand didn’t care what was being said on Facebook, as long as they were harvesting ‘likes’. The lesson to be learned here is if you are going to encourage engagement with fans, it is always best to have a strategy in place for dealing with comments (good or bad), or you run the risk of being a face-less brand that – let’s face it – has the potential to insight anger! Zappos on the other hand, are open, transparent and even have a dedicated area for customer comments and queries. In addition to this, Zappos have an average response time of 1-2 hours. Great! Partner categories. (These are related to behavior outside of the platform, such as home-owner). Advertising on Facebook is designed for businesses. Throughout the duration of your ad, Facebook keep you updated about its performance and budget spent and everything can be tracked through the Advert Manager. You can set tiny budgets of around $8 and specify maximum spend and if you’re unsure of how to approach Facebook advertising, they have a great guide. As well as promoting your page on Facebook, you can also promote your page away from the platform and there are several ways you could do this. Integrate Facebook onto your website: You can add static icons, share buttons that allows visitors on your website to share selected content directly to their news feed and social logins, which is when you login, via Facebook instead of creating a separate account. Make sure that campaigns are integrated: Whatever messages you are using to push a product or promote your brand, make sure that there is consistency both on and off-line. Additionally, when advertising off-line always refer customer to your Facebook page. Link to Facebook on all digital communications: When sending out emails, newsletters and blogs, ensure that there is a link to your page in your email signature. You could include a snippet of your Facebook page in your newsletter and link to your page directly from your blog at any opportunity. If your business has a physical location that customers can visit, be sure to activate the Check-In feature to allow customers to check-in. This is then published onto their news feeds without them having to create a new status update. As you can see from the example above, when you check into a local business the status is automatically populated with a map of your location, an image of the business and a link to the business page. This is a great, simple and a free way of getting a quick mention that is visible to potentially 100s of Facebook users. To make this feature available you will need to choose Local Businesses for your page category. There is a step-by-step guide for activating the check-in on Facebook. In just a few years, the nature of the web has changed drastically. Gone are the days of static web pages that are passively consumed by visitors. But now, the internet is dynamic and, to a certain extent, user-generated. Anyone can buy a domain, start a blog and publish almost whatever content they want. In this media landscape it’s more important than ever to actively manage your reputation. Not only does it help customer service and brand awareness, it’s also vital in keeping your customers engaged. Look at it this way: 72% of consumers use social media to engage with brands, and pretty much everyone, including 95% of millennials, expects your company to have at least a Facebook page. In this piece we’ll go over how to find and track people talking about you and how to manage your reputation online. Step one in online reputation management is finding where and when people are talking about you. Ideally, you should be able to search for your brand on Google and see your homepage, social media pages, reviews and mentions, in that order. If your brand is on Twitter (and it should be), use the new Dashboard custom feed to find people talking about you. Custom feeds do more than just alert you to mentions - it finds any Tweet mentions a specified keyword or phrase. When you set up your custom feed, your name and @username are automatically included in your custom feed, but also include any of your brand names, product names and hashtags that are relevant to your business, and add negative keywords to filter out anything that’s irrelevant. Setting up your custom feed this way will make sure you’re not missing out on any part of the conversation. You can go back and add or remove any keywords as your business grows and changes. Monitor mentions of your business on the web using Buzzsumo to find content that talks about your company, brands, products or people. Once you’ve identified influencers in your niche, set up specific alerts to notify you whenever they mention your brand or products. 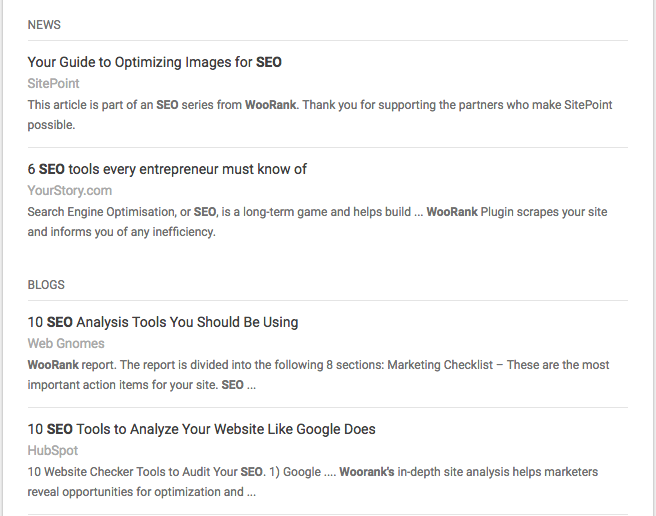 If you’re an international or multilingual site, like WooRank, create alerts for each language you operate in. There’s a chance your Spanish-speaking customers aren’t talking about you in the same way as your English-speaking customers. Finally, set up Google Alerts for your company. What’s great about Alerts is that when you set them up, it will give you a preview right away. So you’ll not only see what people are saying going forward, but you’ll immediately find what people have already said about you. This can be very valuable since it will give you some history and context surrounding what people are saying about you. Remember, when setting up your alerts, don’t limit them to "Only the best results". Depending on how many mentions you usually get, this could really limit the scope of your research. The same goes for how often you receive your mentions. If you get mentioned a lot, it might be best to receive alerts at most, once a day, if only for the sake of your inbox. Business reviews are an important part of local SEO and off page SEO. Reviews act as powerful citations and give your business the chance to piggyback on review site’s ranking power. Putting your name and website URL on Yelp could get it to rank for keywords you otherwise wouldn’t be able to compete on. They’re also an important aspect of the conversion process: 80% of online shoppers trust reviews they read online as much as they do personal recommendations. So it’s really important that you encourage your customers to leave reviews. A call to action or Yelp badge on your website. This can be on the home page, product page or in the navigation footer of the site. Your email signature. This includes both your personal email address as well as the email account you use to send automated messages like order confirmations. If you’ve got a brick-and-mortar store, put a sign in your window and next to your point of sale. If you’ve got a business card that you add to your customers’ bags after purchase, solicit Yelp reviews there as well. 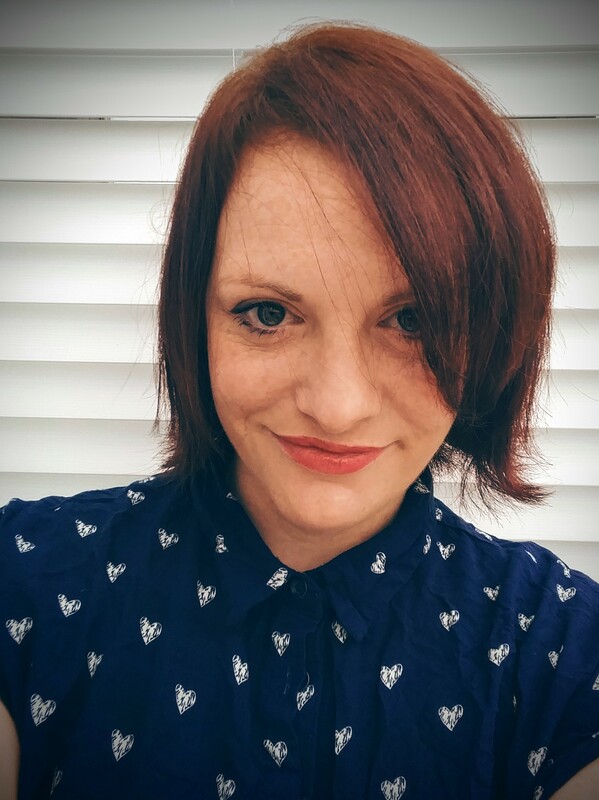 Blog: Blogs are a great way to engage with your audience and you can use yours to establish your company as a leader in the industry. Consistently providing information and insights into industry trends and best practices will position you as a voice of authority in your niche. You can answer any questions in the comments section, giving you even more engagement with your customers. Plus, they’re great for SEO. Social media: If you’re doing something newsworthy and want to reach a wide audience, publish it on social media. Don’t limit yourself to just Facebook or Twitter. LinkedIn, YouTube and Google+ all rank well in search results. Optimizing your social media pages using your important keywords is an important part of off page SEO. Website: Your website is vital to your marketing and sales process, but it also plays a big role in your reputation management as well. People like to know who’s behind the businesses they patronize, so make sure to have a robust "About Us" page, or have bios for your prominent team members. Strong biography pages include, not just name and job title, but also any professional qualifications and unique experience that demonstrate why your customers should trust you. Provide some outside hobbies and interest so people can get to know you and your team better. Keeping this information fun and up to date will make you look legitimate and welcoming in the eyes of potential customers. No one likes criticism, so it’s easy to get defensive when someone Tweets something critical, or bashes you on Facebook. If that happens, it’s key to keep your cool and avoid pointing your finger at the customer. One of the most famous instances of business owners losing their heads over negative reviews is Amy’s Baking Company. The owners responded to a negative Yelp review, calling the customer "ugly," “loser” and a “moron,” and suggesting he eat at another restaurant. The story got picked up by a local newspaper with more than 1 million visitors, severely damaging the company’s reputation (this happened in 2010, three years before the infamous episode of “Kitchen Nightmares”). Instead, frame the conversation to focus on how you can support a dissatisfied customer. Take the example of Taco Bell. After it debuted its breakfast menu in 2014, the company president was presented with a picture of a poorly made item during his Reddit AMA (a live Q&A session). Instead of ignoring the problem or dodging blame, he owned up to the company’s mistake and took steps to rectify it. Don’t ignore or delete negative comments either. In fact, responding to them can be a great opportunity to improve your brand awareness in a positive way. People like to see a business own up to its mistakes and do better next time. Doing so will not only help allay customer concerns surrounding quality, but it will help people remember your company in a positive light, which is what you’re after in the long run. One of the most recent brand management commandments is "Be radically transparent." This means adopting a communication mode that lets employees talk publicly about products and/or services, establishing an open communication channel and embracing and responding to feedback. Opening up to feedback and criticism from the public has benefitted companies that follow this approach, even though it can be difficult for small and medium-sized businesses that might not have dedicated social media or marketing teams. However, if you find and monitor your reputation online, and respond in a positive and transparent manner, you’ll be able to maintain and improve your business’ reputation. Plan: What do you hope to achieve from a Facebook marketing strategy? Is it sales, brand building, answering customer queries and problems, or getting to know which product or service is a hit? Budget: Setting up a Facebook page is free but it is free for your competitors too. What will you do to set yourself apart to raise your chances of exposing your brand to the larger Facebook audience? Spend some money on promoting your page. Schedule: You must know when your fans are active on Facebook. There is no point in posting interesting information when your fans aren't online. Frequency: How often do you plan to connect with your customers? You must be consistent and it's a fine balance so why not check out some of your favorite brands and see what their approach is. Once you have optimized your page and began sharing content don’t forget to constantly assess how well you are doing. There are loads of paid and free tools to help you with this so be sure to post regularly and creatively and always be responsive to your fans. Keep referring to this post and we are confident that you will become effective at promoting your brand on Facebook.